CORONADO -- A Coronado woman says police officers went too far when they used stun guns on her dog three times, leading to his death. "Just that morning, we went for a run. He was the happiest dog," Rocylnn Nosek said of her German shepherd, Smokey. On Saturday night, while Nosek and her fiancé were at dinner, her aunt forwarded a bizarre Facebook post. She read the post to 10News: "He has a collar but has been barking at people and won't let anyone near him; looks like he's waiting, wanting his human parents to take him home." Nosek has no idea how Smokey got out of their second-floor Coronado condo. Someone took a picture of Smokey and posted it. "As people were walking, he was probably barking saying, 'Hi, help me, where's my mom?'" said Nosek. Coronado police told 10News anchor Itica Milanes that a Navy veterinarian called 911 about the loose dog. An officer spotted him along the path where Nosek ran with Smokey every morning. "So one of them tased him, and then I guess he got away," Nosek said. "Smokey kept running. And then the second officer, I guess, then found him at the park and he tased him twice." The veterinarian reportedly claimed Smokey was being aggressive. "They didn't have to taser him. Animal control in east L.A., they use a net to get stray dogs," Nosek said. Officers finally caught the 6-year-old Smokey and took him to a hospital. "He had the thing around his neck with the pole, he had a muzzle around his mouth, he had been tasered three times. He had blood all over his face. His back legs were tied," Nosek said. Nosek and her fiancé got there in time to see him alive one last time. "Smokey is dead. He's dead. He's gone … because of their lack of training," she told 10News. 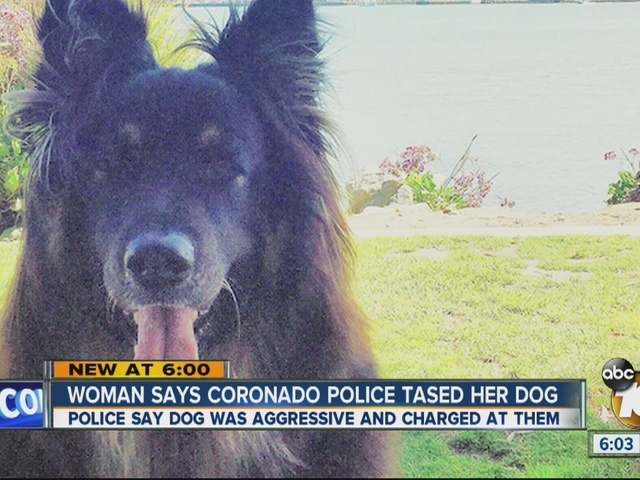 A Coronado police captain said the dog was stunned twice, but even so, Nosek said her dog is dead and she wants the department to deal with aggressive dogs with less lethal force. The captain said the incident with Smokey was considered a public safety issue and officers did what they thought was appropriate in that situation.